Check out all of the awesome prizes we gave away at during the live show! Special thanks to Things From Another World, The Monster Project and IDW Publishing. Was it all a bit too much? You'd better believe it! Now that I’ve decompressed from our night of awesomeness that was the “Kaijucast Emergency Broadcast” (aka our live show), I’m able to post the audio from that TWO AND A HALF HOURS OF UNMITIGATED CHAOS! Seriously, this was a lot of fun, but clearly it went on too long. Why do we pack so much into one episode? I have no idea, but consider this your Xmas present from the Kaijucast crew. My fantastic co-hosts Heather and Jeff joined me in the studio tonight, we had a chat room that unfortunately had a limit of 25 chatters (something I wish I had known beforehand) and the live streaming audio. Our special guests who joined us via Skype were Bob Johnson of the Japanese news website, SciFiJapan.com, Matt Frank of Godzilla fandom fame and the “store crush” covers for IDW’s Godzilla Kingdom Of Monsters promotion, Jeff Zornow (another Godzilla cover artist and huge Godzilla fan), Miguel Rodriguez from the Monster Island Resort Podcast and Thomas Matis of the Tokyo SOS Podcast. 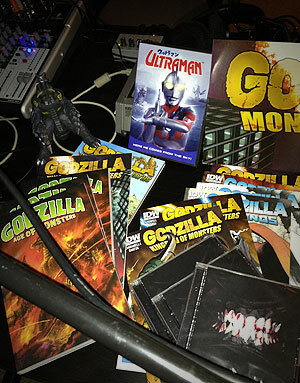 And as you can see from the image in this posting, we had a TON of stuff to give away. Being unable to listen to the live stream, I have no idea how it all sounded, but I know there was a minute and a half delay, so I hope that didn’t detract from the episode’s audio. So this is it… our live show. Hope it’s enjoyable for those who weren’t listening live and in the chat. Hilltown Kaiju – home of the Kaiju Bros! Things From Another World – check out their Holiday Gift Ideas page on TFAW.com! The Monster Project – make sure you check out Adam’s awesome music project! Congratulations to all of the winners of the fine products provided by the above donators! I forgot to talk about this much during the episode, but make sure you send your thoughts, questions and reviews of Godzilla vs. Destoroyah via email before December 25th to have them included in the next episode of the Kaijucast! Again, I hope this episode is a fun one to listen to. Apparently people want another live show to happen again and I kind of have a fair amount of bandwidth left, so I’ll keep that in mind.